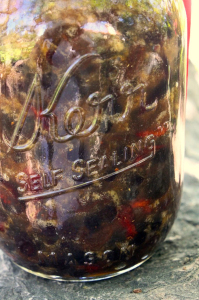 Okay, so it’s June and I’m posting a jar of Christmas mincemeat, but you see, in order to be ready for Christmas, we need to make mincemeat now. According to the artisan bakers at Brasserie Bread in South Melbourne, Australia, the mincemeat should be made a year in advance. So I’m a couple of months late, but I’m betting it won’t make a world of difference as a minimum of 6 months is recommended. My friend Lisa in Australia sent me this recipe and after reading the reviews and ingredients, I knew I had to make it. I’m sharing it with you in case you too would like to have some homemade mincemeat on hand to bake some pies at Christmastime; maybe even to have a few jars to give away as presents. It’s so unlike me to be this well-prepared, so there’s hope for us all!